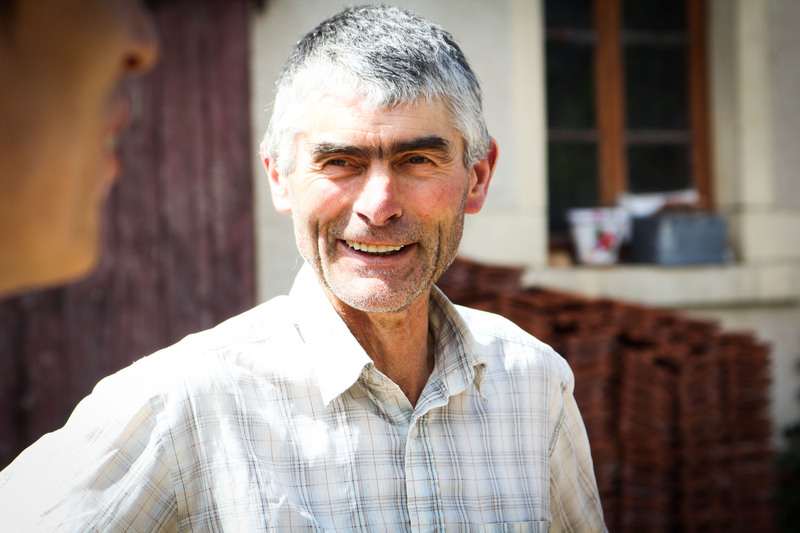 Michel Guignier's property reflects all the dynamics of natural wines, pure juice! on organic and biodynamic technologies. of grapes and its sensitivity". 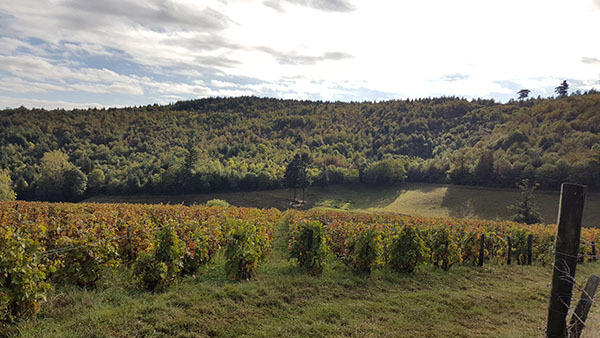 This paradise in which we grow up our vineyards is located in the foothills of the Massif Central which borders in the southwest on communes of Fleurie et Chiroubles. On the one hand, grapes receive beams of a rising sun on slopes which are from the southeast side while on the other hand, it is lulled by the sunset that helps us to develop silky wine with a unique taste. We consider that the spirit of an organic and biodynamic agriculture is necessary for the environment to offer the lovers of this drink a natural wine. 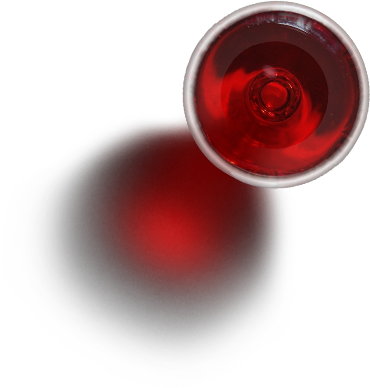 Our wines will tempt you with the originality, feature and color. A production of biological agricultures is without pesticides, chemical or synthetic products in order to protect the soil, water and the environment from pollution. 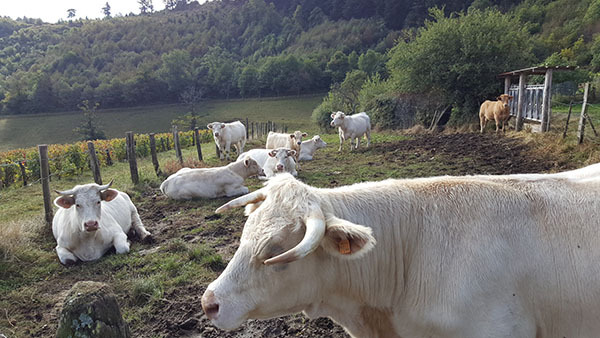 The technology of a biodynamic agriculture continues the purpose of the organic production, allows to watch a plant and have an opportunity to provide all necessary during its growth. 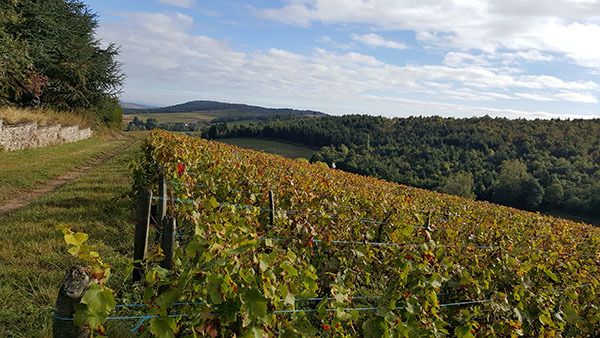 A view of the growing vineyards. I got into the agriculture out of respect for the soil and future generations. "For me, the agriculture is a polyculture which represents the strength of the farmer against accidents of nature with its diversities that allow me to receive an autonomous use of the soil. 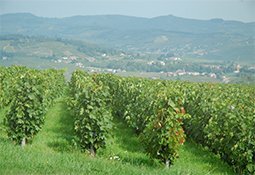 By it, we understand its exploitation for cultivation not only a grapevine but also grain crops, vegetables, fruit trees and alive organisms which stimulate soil life. Fascinated by nature, I also practice biodynamics where life of the soil is important. This ancient practice allows to understand the basic principles of the soil necessary for its health and good growth of plants. For this reason, every year we use biodynamic natural medicines for stimulation of life of the soil, growth and health of plants – thus, they exist in harmony with nature. Processing of the soil stimulates life of bacteria and helps to keep balance of quantity of weeds. 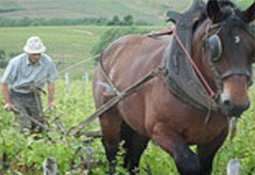 We stimulate the grapevine resistance to diseases by means of grass injections (a horsetail, a nettle) in addition to sulfur and sulfate of copper. 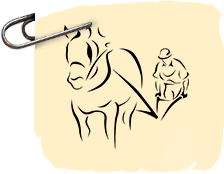 By means of these natural methods which demand hard physical activity, we favorably influence flora and fauna and create favorable conditions for life. 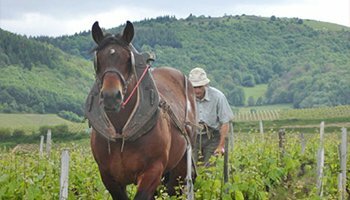 As it is the hilly terrain when grapes grow on a slope, and they make more than 50%, the farmer uses a winch. 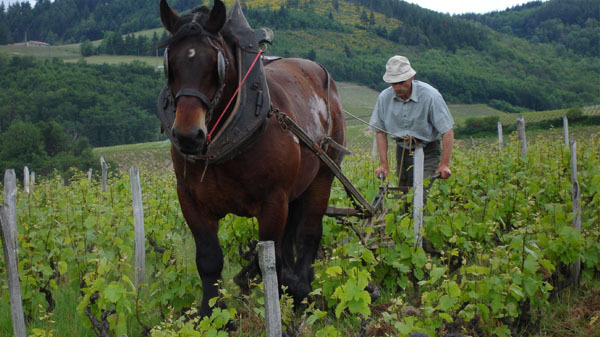 As the distance between grapes is small (meter on meter) they use a horse to plow the field. Grapes is collected manually to save each berry. 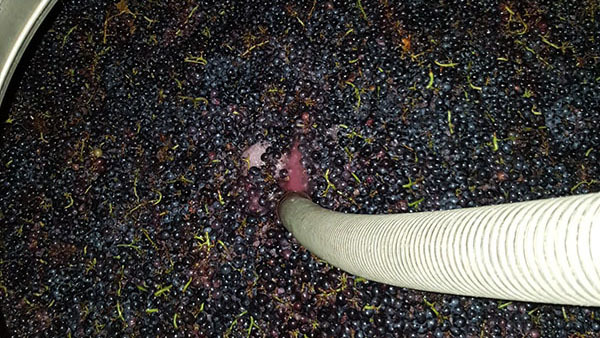 Date of collecting is especially important if we want to have grapes of a good maturity. It is defined in a few days before the harvest. Grape harvest is carried out manually that allows to select good grapes especially for our production in semi-coal maceration. 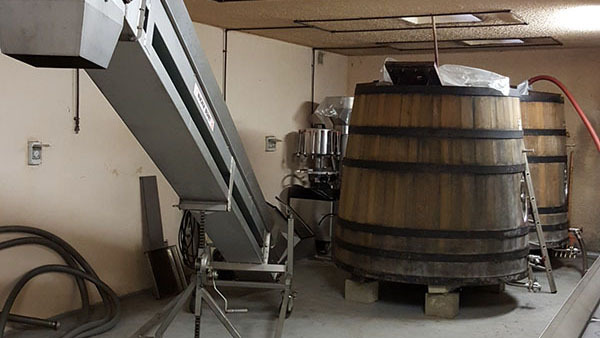 Semi-coal maceration is traditionally used for the production of Beaujolais that allows us to create wines which can be used "young" that can pleasantly surprise you. 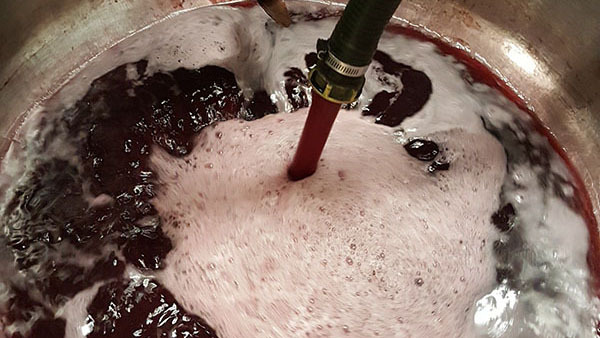 Wine is traditionally made by means of natural yeast of grapes without additives, thus we develop natural wines with shades of fruit, flowers and spices. 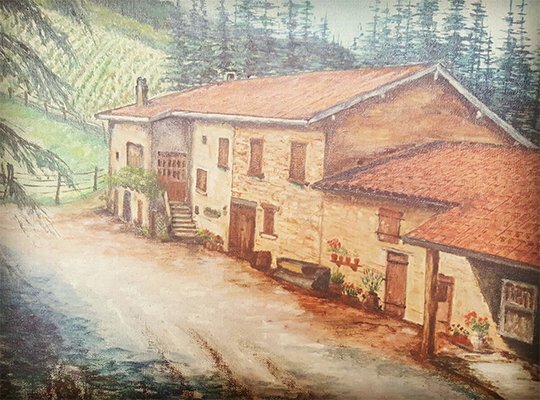 All our wines are made without additives, they pass stages of natural subsidence and "cultivation" that at the end, being not filtered, it has been carefully bottled. "For me wine is created in a vineyard, but not in the cellar, there we only watch it." We look for natural wine (pure juice) directly from the soil which taste will charm you with the originality and variety. "I cultivate life in grapes, my wines are alive, they can be closed from you or open to you in the full bouquet". 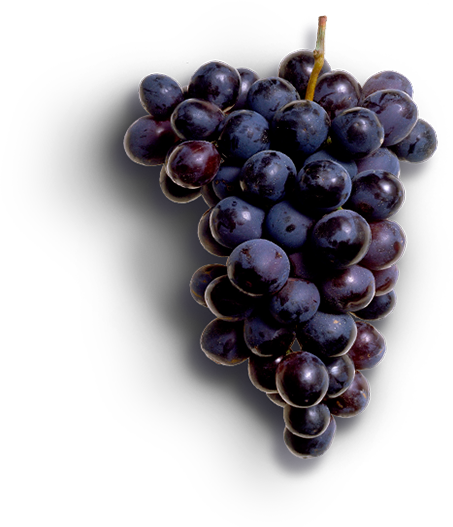 We make qualitative grapes which we collect during the optimum period. Wines are stored in special barrels. 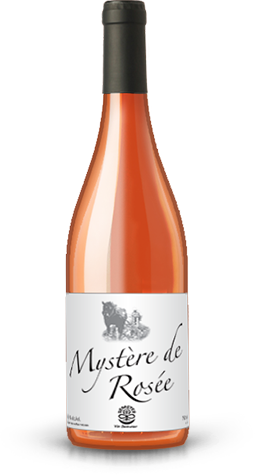 Mystère de Rosé (French wine) is a fresh wine which is drunk young to feel completely all saturation of aromas with a subtle fruit and flower shade. 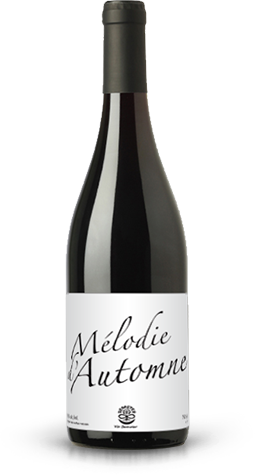 Mélodie d'Automne (French wine) is a pure grape juice with a subtle fruit shade. It is absolutely natural and brings the mass of pleasure. Oh…! (French wine) is the first pure grape juice which was bottled during the spring period. It has very soft taste and should be enjoyed in small amounts! Granite (French wine) is a natural wine in which intensive flower shades prevail. It is grown up on the certain site with very rich soil that certainly beneficial influences taste of wine. Moncailleux (French wine) is an organic natural wine with very rich structured taste and easy aftertaste. Unlike other young wines, this wine likes to grow old. La Bonne pioche (beaujolais village) should be drunk very easily because it represents a pure grape juice with berry aroma and thin tannin. Au Bon grès (Fleurie) is a natural wine in which flower aromas prevail but there are also some berries. It is a very distinguished wine with an elegant taste that generates a bouquet which is especially pleasant to ladies! 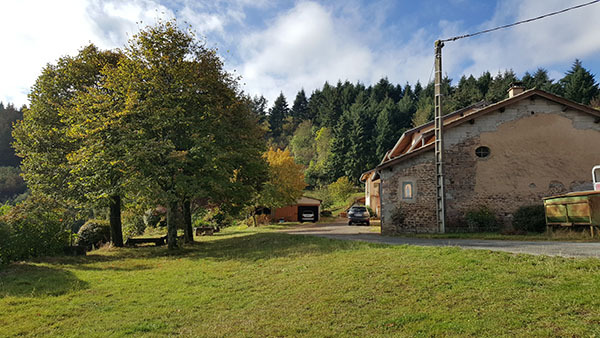 Petite Oseille (Moulin à vent). The key characteristic of this wine is that grapes for it gather from the soil which is very rich with manganese that gives to wine spicy aroma. 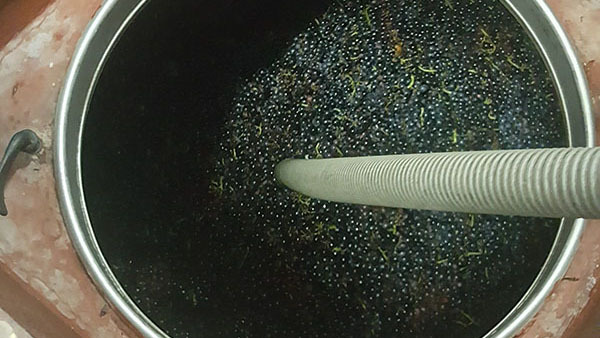 It is also possible to note berry and flower aromas which, together with spices, create the unique taste amplifying over time.